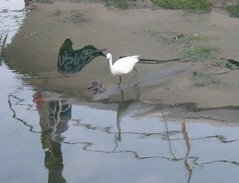 This Little Egret is a regular, and somewhat favourite, visitor to the mud alongside Lady Jane as the tide is going out. It is pretty shy, and tends to fly away at slightest distubance anywhere near it. I see that the Royal Society for the Protection of Birds (RSPB) lists the little egret on it's amber list as a 'rare breeding species' (50 pairs in the UK). Watching it fish is an entrancing experience, as it stands perfectly still, waiting, then dashes forward and, almost delicately, jabs at a fish. The slightly bigger fish take a bit of jiggling around in it's skinny beak, so they can be swallowed head first. It almost never misses when it strikes for a fish, a track record the human fishermen on the creek would be envious of. Another load for the skip. This is now the third, or maybe even the fourth, skip that I've filled with 'stuff' from the boat. I have no idea how much it all weighed, but I'd guess it was a lot. 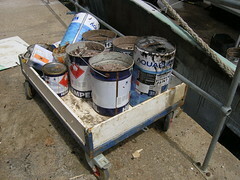 Last time I filled a skip I had, purely by chance, compensated to some extent with a load of ballast. This time there was no compensation for the weight of junk removed from the deck, so Lady Jane is now riding even higher by the bow. The good news is that all the wood from the stern accommodation, and the piles of junk from on deck is now all gone. Oh yes and if that trolley of mine looks a little battered, it's because it gets used all the time. I don't know how I'd manage without it. Finally, the decking (sole) in the aft accommodation has been taken out. I've been in two minds as to weather to do this or not, as it was a perfectly good surface. In retrospect, I'm glad I have - as the old wood stank! 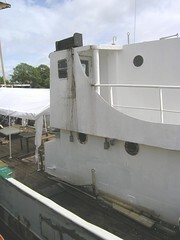 There is some rust-busting and cleaning up to do, but on the whole things are in good shape below the deck line. 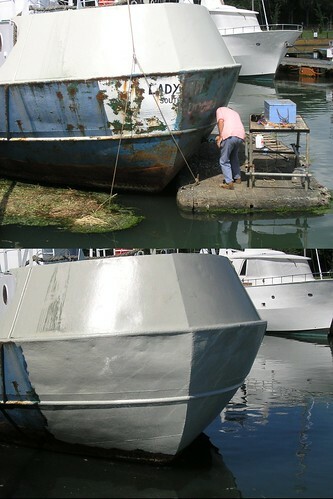 After a quick lick of bitumen paint, I'll finally be ready to start re-fitting the stern accommodation. It is now exactly two years since I bought Lady Jane. As you can see from the picture above, I've made what I consider to be pretty good progress, all things considered. As I've said before, it's not so much what you can see, but that which you can see represents an enormous amount. Two years ago I had no boats, now I have four and have learnt so much in that relatively short space of time. What a journey it has been this last two years, with some very big ups and some very big downs. It must be said that there have been more ups than downs and, seeing the leaps and bounds I've been making just recently, the overall outlook is good. I feel I've really got that rust on the run now. Here you can see the progress I've made on the foredeck. The newly primed section you can see will finally be painted with green non skid paint, though there is still the forward section and edges to rust bust first. You can also see the view I have of Fareham Creek in the background of the picture. I'm reminded by the wonderful days I've been having just recently, both in terms of my progress and the ambiance, of just why I'm doing all this. We have had a spell of good weather, which I've taken maximum advantage of. In the top picture you can see Fred merrily splashing Rustroy over Lady Jane's stern, in preparation for the primer. Oddly enough, in this instance the after picture almost makes things look worse than the before picture. I think that's because of a combination of reflections from the water and the lighting showing up the lumps and bumps in the underlying steel. At this rate, it won't be too long before I turn Lady Jane around and start work on rust busting on the port side. I'm expecting work on the port side to go much, much, faster than the starboard. Firstly because the steel is in so much better shape but, more importantly, I know what I'm doing now, and have the right tools and equipment to get the job done. Sadly, all five of the swans eggs have gone. There are not even any bits of shell around, or anything. Because there is absolutely nothing left on or near the nest, some folks suspect the eggs may have been removed by people for some reason. George and Mildred can now be seen moping around Fareham creek. How satisfying, look at the difference in that back deck! What I had been expecting to be a straightforward project has taken far longer than expected to complete. The first picture, on the left, was taken just short of a year ago now. What is a little sad, in some respects, is that people who now see the back deck have no idea of how much effort, by so many people, it has taken to look like it now does. I'm expecting this particular paint job to last years and years, as I've cleaned up the rust etc. 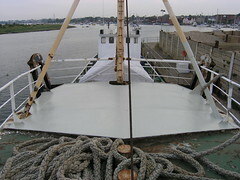 as best as I possibly could and have used Hempel paint, which is widely regarded as a top quality marine paint. 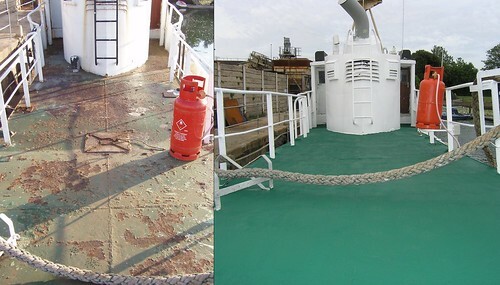 The matt finish you can see is Hempel non-skid paint, which gives the deck a rough finish, similar to coarse sandpaper, which makes walking about on deck in the wet much safer. The only small job left to do now is to re-install, and test, the stern lamp and the back deck project will then truly be complete. Painting in the steering room is now complete. This is a background project, I know, but it is nevertheless very much key to progress elsewhere on board. The next step will be to build shelves and a small workbench in the rounded space you can see to the right of the picture, right at the stern of the boat. Once I've got the storage space in here sorted, I can then clear the contents of the forward locker, right in Lady Jane's bow. 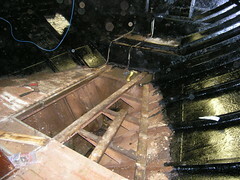 With the forward locker empty, work on installing the anchor system can then begin. I'll also finally be able to get going with replacing some of the plates which have rusted through up forwards and, of course, rust bust and repaint the rest of the place while I'm at it. No Lady Jane post today, as progress has been non existent due to me feeling a bit ill recently. Nothing serious, just bleah. Anyway, this gives me the opportunity to catch up with what else is going on in the marine world. A while ago I posted about the M/V APL Panama, which was shipwrecked down in Mexico back in December 2005. 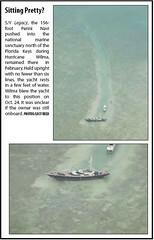 It turns out that there is an even more intriguing story, relating to the yacht Legacy, who got left high and dry after causing what appears to be a substantial amount of damage, a result of Hurricane Wilma back in November 2005. I bet that was a wild ride on board that night! I first read about it at the interesting and entertaining blog Eli Boat some time ago. There is a fascinating thread on the subject running at Sailing Anarchy, which is worth checking back on every now and then. My calculations are based on the guide from Countryman & McDaniel, which is a site well worth a browse when you have a few hours to spare. It looks like it will be some time before this particular wreck is sorted. Looking back, I see I've not said too much about the swans recently. So much else has been happening. Mildred has been sitting on her nest for quite a while now, which is why work on Lady Jane's bow has stopped. 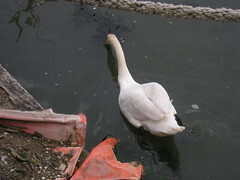 The picture shows Mildred off the nest, dragging seaweed back to the floating platform her nest is on. I think this is a sign that her eggs may hatch soon. It's rare to see Mildred off her nest, so it gives me an opportunity to see that her eggs are all still intact. This year she has five eggs, compared to last years eight. Hopefully Mildred will have more success with her cygnets than the poor old duck had with her ducklings. It's a case of two steps forward, one step back. The other evening I arrived at Lady Jane, only to be greeted with this sight - streaks of bitumen run off from the roof of the wheelhouse. To explain: Lady Jane's wheelhouse is comprised of both aluminium (aluminum) and steel, with aluminium making up the forward and upper part of the wheelhouse. Other than weight, which I think is negligible, I can think of no reason why this should be so. The upshot of the aluminium/steel combination is a line all the way round where the two metals are joined, which are subject to galvanic corrosion and therefore leaks. I've filled this line with bitumen and other roof sealants as best I can, but this will remain a problem area until I replace the aluminium section with steel, as part of the overall wheelhouse refurbishment project. 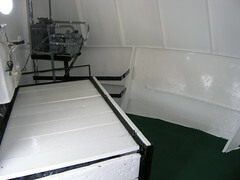 In addition, the original compass binnacle housing in the wheelhouse roof has been cut away and replaced with a plastic cover from somewhere or other. This has always been prone to leaking. I know I need to make time to do a proper repair, but it's not been that high on my list of priorities, as it has only really needed periodic patching to stop any leaks. Anyway, I had just done another of the periodic patches, this time with a dollop of bitumen. Well maybe quite a big dollop - bigger than strictly necessary - on account of the fact that I was fed up with having to do this again after hearing drip, drip all night. The thing was, I had applied this 'dollop' just before a spell of heavy wind and rain, which meant that the bitumen had not set before it got blown/washed all over the place. I had planned on working the evening I first saw the mess, but changed my mind and went down the pub instead. Needless to say the black streaks were invisible by the time I got back from the pub. I suspect that cleaning this up will be no trivial task. Oh well, things had been going rather too well. 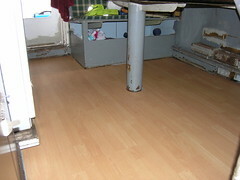 After the success of the laminate flooring in the wheelhouse, I went ahead and slapped laminate down on the galley floor as well. As visitors to Lady Jane well know, the old floor surface never really cleaned up properly at all. To say that I'm pleased with how it turned out is somewhat of an understatement, it's had such an immediate and incredible effect. From now on, unless there is some kind of protective cover in place, outside shoes are banned in the galley. I know this flooring is only temporary, but it is such a pleasure to have a clean galley floor for a change. Just one more step in this journey towards Lady Jane being home. 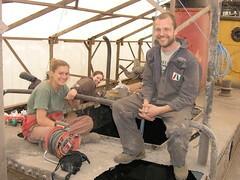 I dropped in to see Seb and Becky, who are still working away on Wendy Ann 2. It's such a pleasure to see the progress they are making. It helps remind me that great things are achievable by simply plugging away single mindedly at the task in hand. Seb and Becky were joined by Becky's sister who, you can see in the background, was also looking cheerfully grimy. Together, over a cuppa tea in the dust of their deck, we chatted about shared experiences and dreamt of what may be in store for the future. Seb and Becky can now tell you all about that for themselves as they have started a blog over at The voyage of Wendy Ann 2.